In Franklin next Tuesday, Election Day, incumbent District 2 Alderman Dan Mayer faces off against Michelle Eichmann for a three-year terms. I do not live in this district. But based on my extensive following of Franklin politics I wholeheartedly endorse Eichmann in this race. Mayer needs to go for several reasons. Let’s talk about Mayer’s fitness to serve and lead. This and this alone should be ample reason to send Mayer packing. Mayer later apologized, but it was far too late. The damage had been done. The renewal of Pautz’s term on the Parks Commission was rejected by the Council that couldn’t wait to dump him. A mysouthnow article last June about a Franklin Common Council meeting noted there were several items on the agenda dealing with approvals of various components of the Ballpark Commons project. Ballpark Commons is in Mayer’s district. Many of the votes to approve were 4-1 in favor. Mayer was the lone ‘no’ vote every single time. Obviously Mayer is no friend or supporter of Ballpark Commons. Hell, if I represented that district I’d personally be doing cartwheels and rolling out the red carpet. 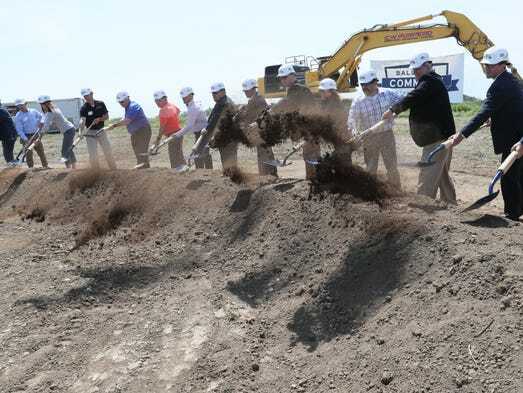 On June 7, 2018, the groundbreaking ceremony for Ballpark Commons was held. Every Franklin Common Council member was there, except Dan Mayer. It’s apparent to me that Mayer has sold out to the vocal minority (on his Facebook page Alderman Steve Taylor calls them “crazies”) that are desperately using every effort to badmouth what is a done deal that will be great for Franklin. His record. Originally Mayer was in favor of Kayla’s Playground being located at Froemming Park, against the wishes of Shelley Runte, and he voted against the Mayor’s veto on that. A motion was made by former Franklin alderman Janet Evans for the playground to be placed at the current site, Franklin Woods. Suzanne Mayer, Kristen Wilhelm and Dug Schmidt abstained. Mayer then voted in favor of Franklin Woods which was approved. After Franklin Woods was ultimately chosen Mayer lost all support in moving the project forward. As I’ve blogged in the past, I wouldn’t know Mayer if our carts bumped into each other at Sendik’s. He may be just like me, the absolute salt of the earth. But my goodness, on the two biggest projects in the history of the city of Franklin he has firmly planted himself in the doorway of advancement, growth, and progress. Mayer has also failed to support Mayor Steve Olson’s efforts at economic development in the city. As a result I ask, what good is he to his district and the city? What are his goals and vision? If he exists on the council just to thwart the mayor and any attempt to better our city, again, what good is he? Given his failure of a track record, Mayer needs to go. On Tuesday I urge voters to select Michelle Eichmann for alderman in the 2nd district. ← Our daughter wins an award and makes the news! ~~~~~~ And I answer: Maybe he is not one of those ubiquitous “yes men” on the council which has always been a problem in Franklin and in most little communities elsewhere. Everyone does not believe Franklin should be another mutation of Milwaukee but a peaceful, residential community. And please don’t start with the “we need big business to lower our taxes”! We know for certain that it does NOT help lower our taxes as “they” always promise. The negative impacts and the footprints these “big businesses” produce are only fit for non-residential areas, and Franklin does not really care WHERE they scatter these commercial properties as we are forever fighting City Hall when they propose their radical placements that ALWAYS infuriates homeowners. Many lessons have been learned! Franklin needs to flip the calendar. It hasn’t been 1957 for a long time.